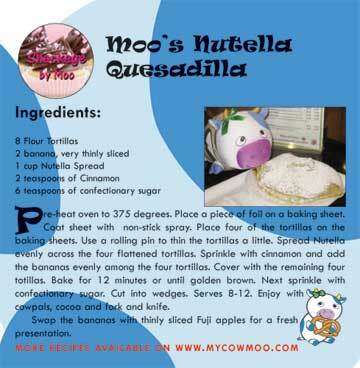 My Cow Moo: Cooking Bovine Style = Easy, Scrumdelish and Moovelous! Cooking Bovine Style = Easy, Scrumdelish and Moovelous! Today I cowpleted the web downloads for the Toys R Us Times Square products. I wanted to have a little gift on my web site for the people who took the time to buy either the Liberty Cow or our book, "Moo York Adventures: A Bovine's Guide to NYC". Everyone appreciates a freebie! Auntie Sonic's friend Alex is helping me with my website. He is uploading our two new downloadable books: "Moo Takes a Bite Out of the Big Apple" and "My Mooments with Moo" NYC passport! I dedicated the "Big Apple" book to my Auntie Sharon because without her love and support, no one would be able to buy the Liberty Cow -- let alone download an extra story! This book is all about food. I even added a few recipes. Here is the recipe for my favorite Nutella dessert! Enjoy!